Scale smoothly from initial project to enterprise-wide program using an integrated environment. Search and share content across multiple process centers and incorporate business process management (BPM) lifecycle governance. This service offers a performance data warehouse that automatically correlates performance event streams directly back to the specified metrics and offers a process optimizer that detects bottlenecks and violations of performance thresholds. Experience an ease of design and deployment of process applications through an integrated design time experience. This service improves reliability, performance and scalability through availability as a service on the IBM cloud infrastructure. The Integration Designer allows you to more easily build efficient straight-through processes and reusable service-oriented architecture (SOA) services, and provides an environment to run customized code. Gain visibility through a business-led change design, engage process participants individually, and scale to support enterprise-wide transformation. You can more easily prioritize work and improve productivity. Integrated coaches help you build and reuse forms, controls, sections and templates to streamline your task completion. Built-in monitoring and analytics help optimize business processes through simulations and comparisons that can be compared against historical benchmarks. Engage process participants individually and scale to support enterprise-wide transformation through a business-led change design. 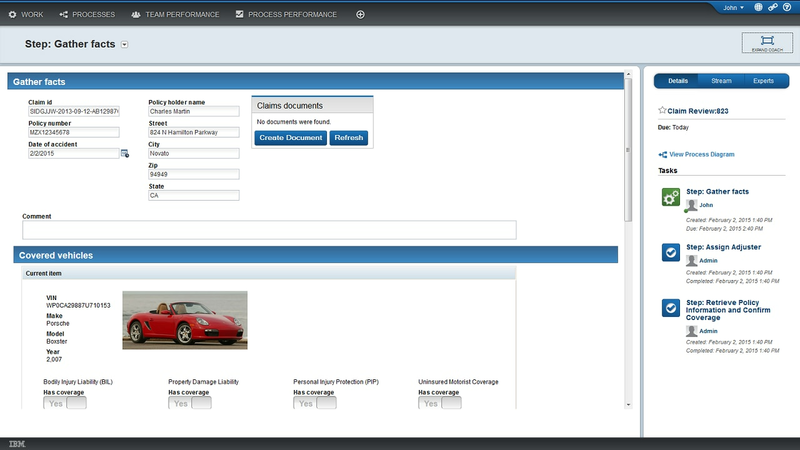 It allows users to see and work from the same process version and enables you to manage change confidently. Portal technology allows for enhanced visibility among users and offers social capabilities to engage specialists. A graphical process designer makes it easier for team members—including non-technical users—to collaborate on process design and analysis. Enables multi-user teams to define a process application, and offers centralized installation and tracking of process application versions. It provides a single software as a service (SaaS) entry point URL and orchestration and integration enabled by a unified BPM runtime. It enables fast deployment in a standard format or as a customizable configuration—and provides improved support for integration scenarios by enabling site-to-site virtual private network (VPN). Experience the improved Disaster Recovery with IBM BPM on Cloud Premium Availability. This option expands the ability of IBM BPM to protect against more severe problems that affect multiple components, or even the loss of whole data center that may result from a power outage or loss of connection. Benefit from an entry-level, subscription-based cloud service that offers a smaller scale, lower service-level-agreement version of the full-size cloud service to help you get started with IBM Business Process Manager or for automating small projects at a lower cost. It provides a development environment where you can create and test process applications, as well as a production environment for running your project. The IBM Process Designer and IBM Integration Designer tools are provided as software downloads. These tools can be downloaded from your IBM Business Process Manager on Cloud instance and installed on a desktop system. The tools connect to the Process Center within your IBM Business Process Manager on Cloud instance when you run them. No hardware requirements exist since IBM Business Process Manager on Cloud is a subscription-based business process management (BPM) cloud service. Learn more about process automation solutions from IBM.